There are lots of interesting things going on behind the walls of the old factories that have been converted to living spaces. High ceilings and brick walls make for a lofty living style. This is the same space where the Wurlitzer was that I showed a week ago. I think an old factory would make the coolest place to live! I almost bought a loft apartment several years ago. I loved the open feel of it and the brick walls. I think loft living would be cool. I like the brick walls. Have a happy day and week ahead. So coool!! I like what appears to be a bricked up doorway behind the bookshelf. Loft living is popular here too. What a great place to call home. Looks like a fun space! 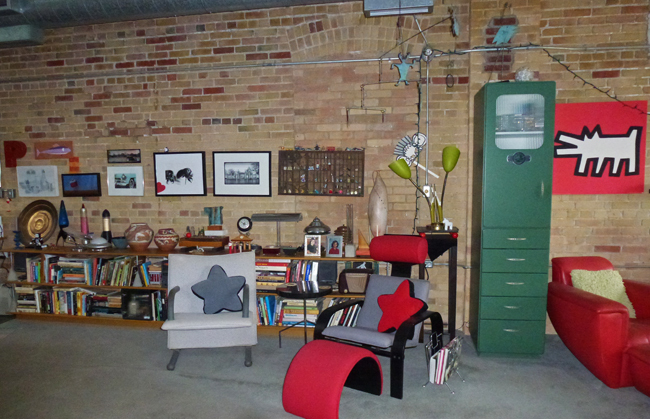 Our city also has lots of loft living spaces combined with studio rooms--perfect for artists ad crafts persons. it's always fun to see them when the apartments and studios are open for tours during art crawls. I find these really interesting! Lots of lovely colourful eclectic things here Pat! I don't think this place is for me . . . I've always found these places very interesting too, and to live inside one would really be something I believe.